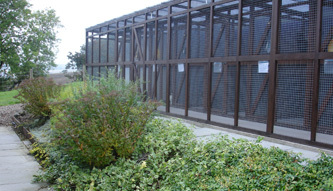 The cattery has 24 individual houses with runs attached. Three of these are built to accommodate up to four cats from one family while the rest are all extremely generously sized to accommodate up to two cats. We offer a choice of penthouse or chalet style houses. The chalets are full height, walk in houses whilst the penthouses are raised off the ground, offering extra run space underneath and are accessed by means of a wooden ladder to a shelf below the cat flap. Each house is fully insulated with a light, heater, shelf, double glazed, opening window and vent. 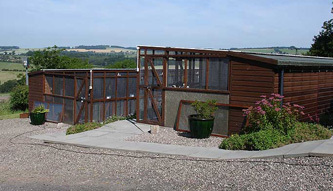 The adjoining runs are all a minimum of 6' long and provide a covered exercise area with a sun shelf. 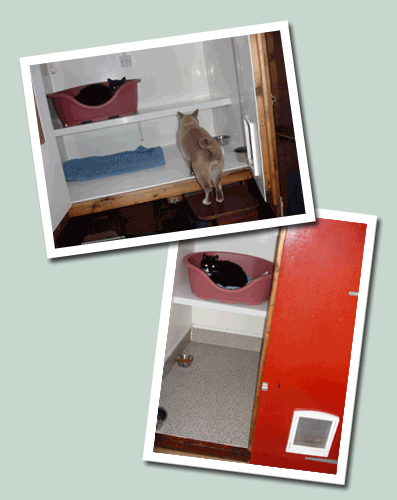 Double-sided acrylic sneeze barriers have been fitted between each run to prevent the possible spread of infection by ensuring that cats from different households cannot come into contact with each other. All runs open onto a main safety corridor with lockable doors for additional security. We carry out a complete maintenance programme each year, including replacement of equipment; refinishing all woodwork and a rolling programme of upgrades to ensure the high standards we offer continue to be met. Owners are encouraged to bring along any items they feel their cat would like to have in their holiday home and we have the space to accommodate large scratching posts and additional beds if required. We carry a comprehensive insurance policy at no extra cost to owners so that if your cat required veterinary attention the fees would be covered. * We have a vet on call at all times and if we were in any doubt about a cat’s wellbeing we would not hesitate to seek professional advice. 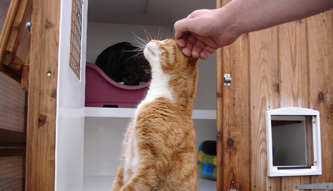 We are happy to care for cats with health issues and who follow a strict programme of feeding and/or medication. We are able to administer pills, eye drops, etc as well as insulin injections for diabetic cats. We have a great deal of experience in looking after elderly cats or those with disabilities and we can easily adapt some of the runs and houses to allow access for cats with particular health issues.